Coconut Pecan Cookie bars look impressive, taste amazing, and are so easy to make! The coconut, milk chocolate chips, and pecans caramelize while it bakes. What Are Coconut Pecan Cookie Bars? The cookie bars with a graham cracker crust is so simple, you just layer it on. The coconut, milk chocolate chips, and pecans caramelize in the sweetened condensed milk and toast up while it bakes. If you aren’t a fan of pecans, chopped almonds are also really good on these bars. You can enjoy these coconut pecan cookie bars with some vanilla ice cream or a glass of cold milk. Yum. Melt butter in microwave then pour into a 9x9 square pan. Sprinkle graham cracker crumbs over butter. Evenly pour the condensed milk over the crumbs. Then sprinkle on the coconut, chocolate chips, and pecans. Bake at 350 for 25 to 30 minutes. Let pan completely cool before removing bars. I love the easy simplicity of this recipe. Wonder about a substitute for the coconut though? Hubby hates coconut and I'm not sure what I would use to replace its bulk. Oats? More nuts? Hmmm, whatcha think? I would definitely try oats, maybe some mini marshmallows would be good! Good eat when busy and on the go…. These are called magic bars because they are THAT good!! I love how cookie bars are so much moister than normal cookies. 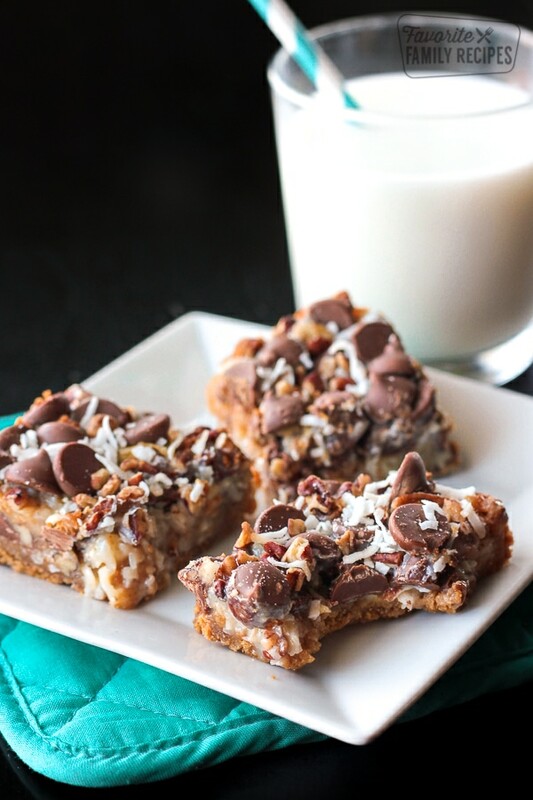 I have made magic cookie bars before I think with Corn flake crumbs and with the condensed milk drizzled on top rather than before the nuts, coconut and chocolate chips but my husband said this recipe was the best he had ever had. So from now on it is favfamilyrecipes version for us! We finished dinner and were all in the mood for something sweet, I couldn't believe how quick and easy the recipe was and such a hit! I think there is only one size of sweetened condensed milk. Don’t buy evaporated milk. They are not the same thing! How many does this recipe server? It depends on how big you cut the bars, if you can get 9 large bars or 16 regular size. If you want more, it is easy to double the recipe and use a bigger pan. Thanks for asking!